The Framing of the Thoughtful House wrapped up this week and the house looks magical. The frame of a house is one of its most crucial parts, since it is the house’s skeleton on which everything else is hung. 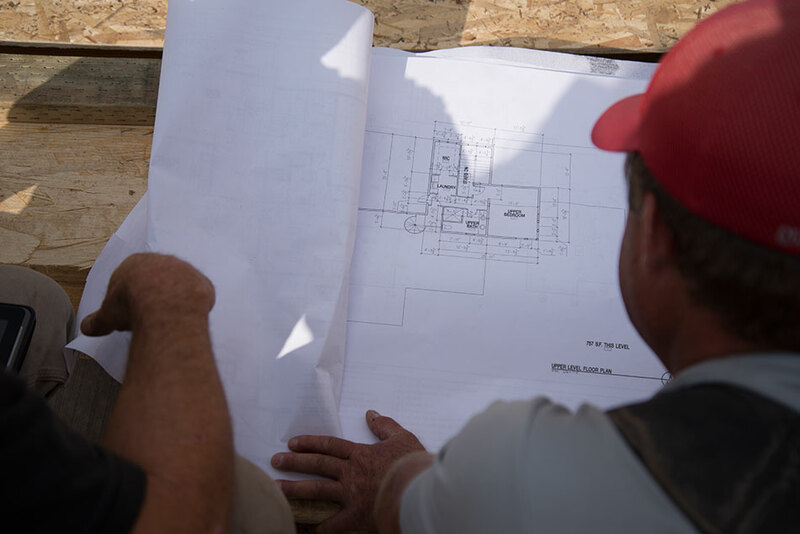 If it is strong and well constructed, it will support all of the house's systems - electrical, HVAC, insulation, windows and doors - as well as all finishes from roof shingles to doors, windows, dry wall, stone and stucco. If it is weak and improperly constructed, walls will crack, dry wall will pop off, doors will jam, floors will bounce and squeak and serious structural problems will become manifest in a few months or years. 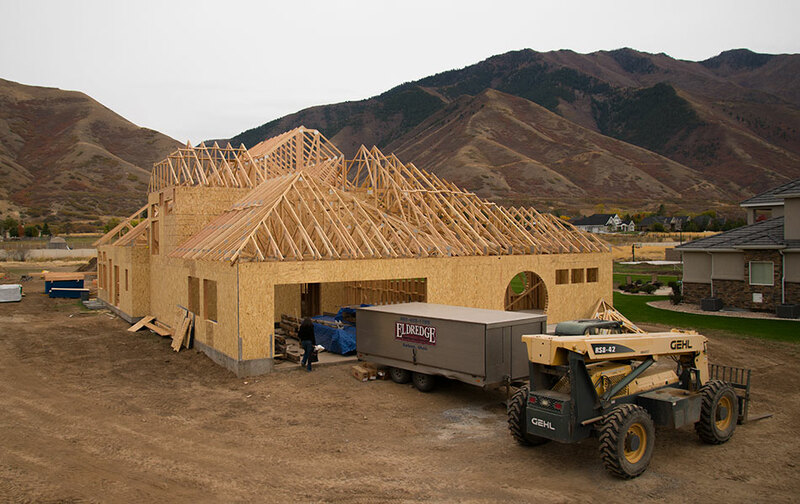 To make sure that The Thoughtful House got the best frame it could, our general contractor, Kelly Adams of A2Z Management & Construction, Inc., hired a crew that a number of people in the building industry have told us is the best in Utah County, Utah, and one of the best in the state – Eldredge Construction Services LLC. 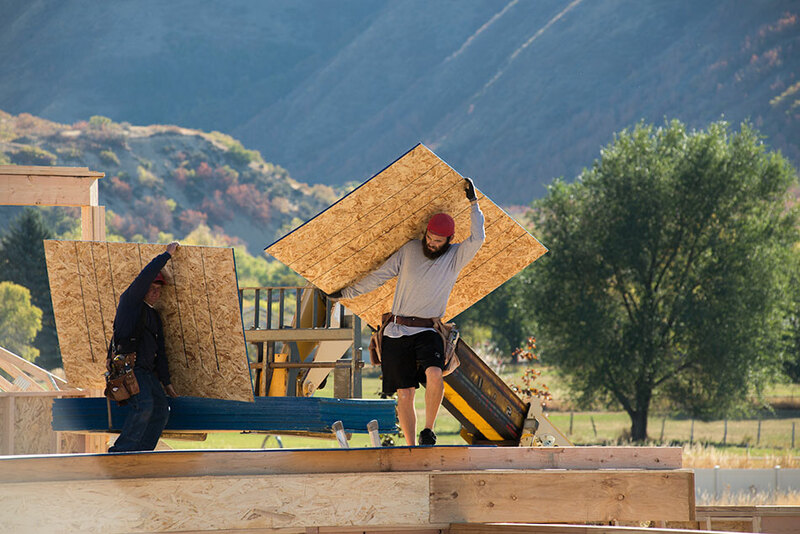 Watching the company’s five-member crew of skilled carpenters build the house was a pleasure. 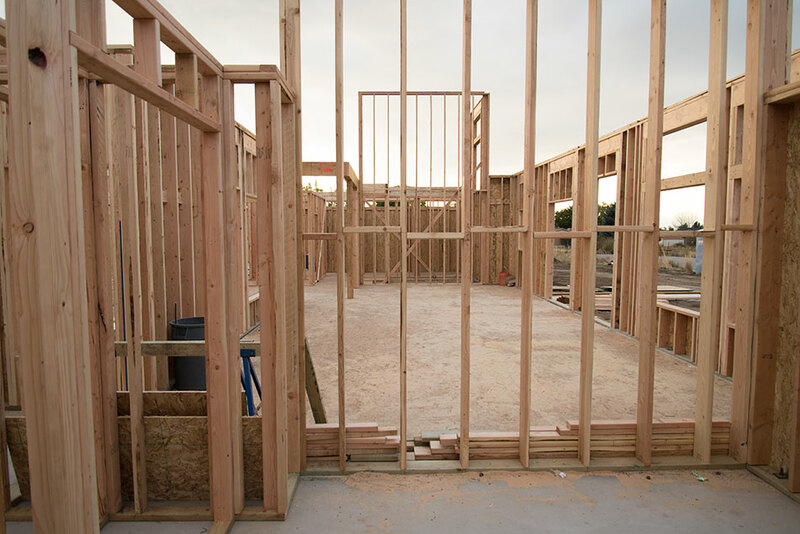 Modern house framing is highly mechanized, from heavy equipment such as fork lifts that are used to put wall sections in place, move materials around and as portable scaffolding to nail guns, skill saws, routers and other electric tools. These tools enabled the framers to put the house together within a month. 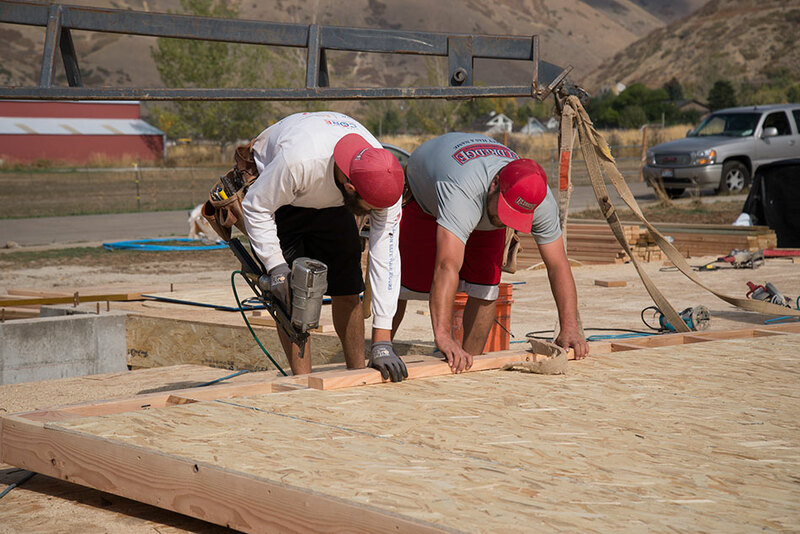 To save time and money on the job site, framers assemble houses such as ours using factory-made trusses, floor joists and standard-size lumber. However, utilizing those engineered parts and wielding those tools still requires a lot of skill, hard physical work, creativity and an ability to translate complex architectural plans into a three-dimensional structure, maneuver heavy construction materials in high places and move around high in the air on boards just six inches wide. The Thoughtful House was built with platform framing – each story framed on the previous one with the roof trusses at the top using dimensional lumber called studs that are nailed together. 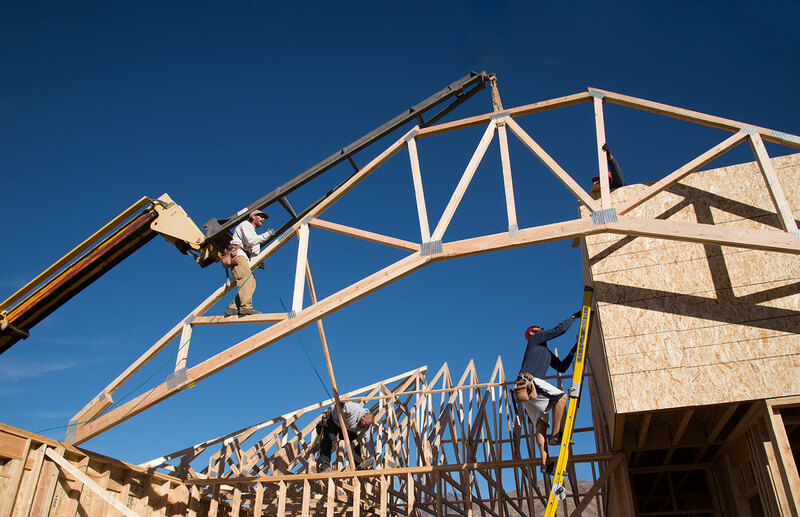 Light-frame platform construction is a cost effective way to achieve a wide variety of architectural styles, so most American homes are constructed that way. Light-frame methods allow easy construction of unique roof designs such as some of the hip roofs and porches on our house. Light-frame buildings usually are erected on concrete-slab foundations that serve both as a floor and a support for the structure or over a crawlspace or basement, with joists used to span between concrete foundation walls. Our house is a combination, because part of it is concrete slab-on-grade and part has a concrete basement. 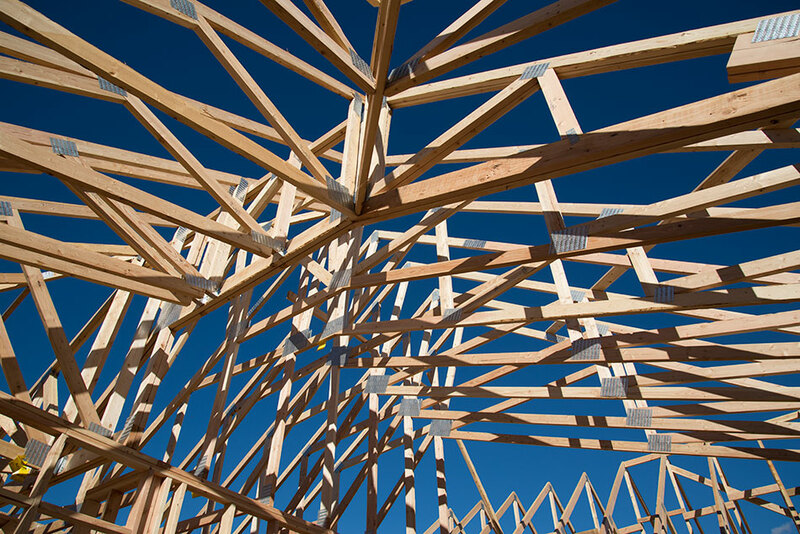 The framing is done with high quality kiln-dried lumber, engineered wood materials that won’t warp or bow in crucial loadbearing areas with long spans and metal parts to reinforce the wooden parts and meet seismic requirements. Our house also includes some timbers that were used as supports on the porches and pergolas, which will be detailed in a future blog. The framers began with the concrete foundation and moved up floor by floor. They first created a wood frame that sits inside the basement. Then they used engineered floor joists to construct the ground floor on top of it. The framers then created each wall section from the architectural plans as it was laying on the ground floor, using mostly 2 x 6 lumber and reinforced with engineered wood panels. They then lifted each section one by one into place with a fork lift, securing the sections with bolts embedded into the concrete foundation and with nails. Each section was checked to make sure that the sections were square and level. Once the sections that form the first story were built, the partial second floor of the house was built on top of it. The roof trusses went on top and then were sheathed with panels to hold the roofing shingles. Engineered panels were used throughout the house to brace the wall studs and keep the walls strong and square. The walls were constructed so that adjoining wall sections fit together snugly at exterior corners. 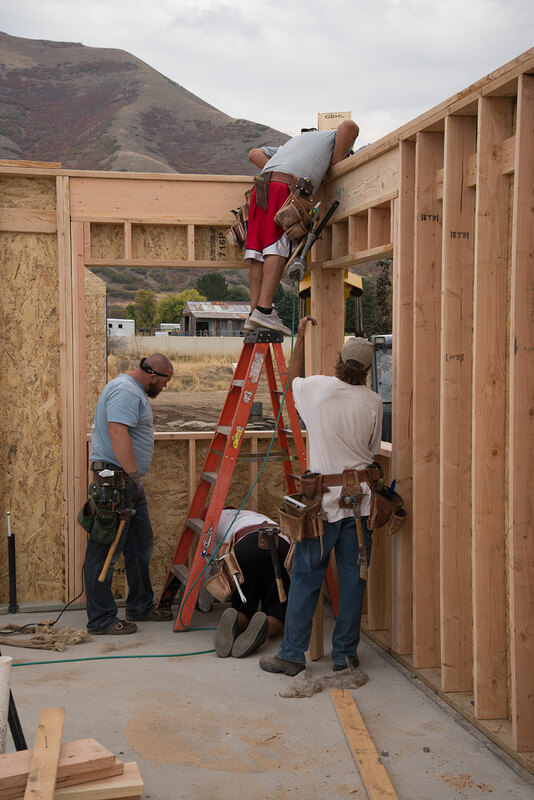 The studs were doubled at openings for doors and windows and the openings’ headers were put in place and end-nailed through the studs on each side. The studs support the upper floors, ceiling and roof and also serve as a base to which finish materials, plumbing, electrical wiring and HVAC components can be attached. Once the wall sections on each floor were in place, interior partitions were added. Some of those are loadbearing partitions that support the overall structure. Others are simply room partitions upon which the stability of the structure as a whole is not dependent . These interior partitions support wall finishes, door frames and trim. The entire structure was fastened together with nails using consistently sized dimensional lumber at regular spacings. The floor is made of engineered wood joists which are more rigid than standard lumber. Their width was chosen to support weight for a specific span. The joists were installed across the shorter distance of the floor span and spaced to support the load needs of the structure. 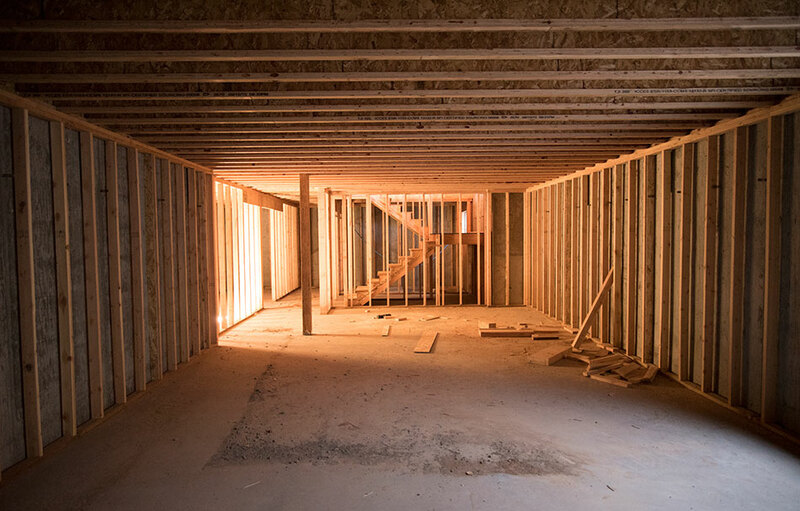 The closer the spacing and wider the floor joist dimension on a house, the less the floor will flex. The roof trusses are held together with metal strips nailed to the top of the wall sections and stabilized with cross pieces of lumber and then the engineered panel sheathing.